You probably don’t realize the special needs of some your fellow travelers until you, or someone in your group, has such needs. During my family trip my mom needed to use an ECV due to wicked arthritis in her knees. If you are lucky to be a guest who has never had to use one of these or a wheelchair, please have patience and be courteous to folks enjoying their vacation from a seat. 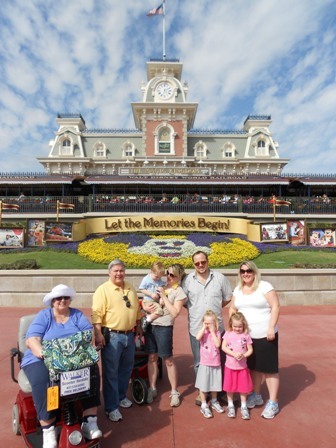 Disney World is a wonderful destination choice for people who are restricted to a wheelchair or ECV; Disney does all they can to make their stay comfortable and magical. If you or someone in your family will have to use and ECV or wheelchair on an upcoming trip I wanted to take this week offer some tips to make things easier during your vacation. Let’s start with some ideas on things you could do before you even leave your house. When you make your room reservation request a handicapped accessible room. You may not be guaranteed one of these rooms, but Disney will do their best to accommodate their guests’ requests. We were able to get one of these rooms at the Polynesian and it worked out really well for us. There were several modifications made to our room to make life a little easier for folks who need assistance. The door to our room would automatically stay open once we used our key to allow time for an ECV to get through. It also had a button to push to automatically open it from the inside. My nieces and nephew thought that button was all sorts of fun. In addition, one of the beds was lower than the other to allow someone to get in and out more comfortably from a wheelchair. However, I understand that some handicapped rooms are simply equipped with a king sized bed. The best feature for my mom was the wheel in shower. She obviously didn’t take the ECV into the shower with her, but she didn’t’ have to step up and over a tub to get in and out. Steps are difficult with her condition so this was the biggest bonus for her. Before we left I also reserved an ECV for her through a third party company rather than using one of Disney’s wheelchairs or ECVs rented at the park gates. My main reason for doing so was to that my mom would have access to her scooter at all times and not just when we were in the parks. The process couldn’t have been simpler! Some friends had used Walker Mobility and highly recommended them so I decided they would be the company we would use as well. I looked at options on their website then gave them a call to set things up. The woman I spoke to was very friendly and set us up with the correct scooter for our needs after asking a few basic questions. When we arrived at the Polynesian her ECV was waiting for us at bell services where we picked it up without a hitch. When they were ready to head home we simply left the ECV at bell services again and they were happy to take it off our hands. A few days later I received an e-mail from Walker thanking us for our patronage so we knew they had picked it up. I would highly recommend their service to anyone thinking of using a third party to rent a wheelchair or ECV during their vacation. Another tip before you leave for your vacation is to make arrangements with your airline to get assistance to and from the gate at the airport. We flew with JetBlue from Newark to Orlando International and found two different experiences at the airports. In Newark I simply mentioned our need for assistance when we dropped off our checked back and within minutes someone was there to help her to the gate in a wheelchair. The woman was cheerful (even at 5:30 am.) and helpful and we couldn’t have been more pleased with her service. However, when we arrived in Orlando there was a wheelchair waiting for her at the gate, but my brother had to push her through the airport. My family also had to push her through the airport when they departed from Orlando as well. Once we landed and had wheeled her to the Disney’s Magical Express desk the cast members there couldn’t have been more helpful and kind. My mom was sensitive to having to be pushed around since this was her first time experiencing a need for assistance. The cast members at the desk as well as outside at the bus were encouraging and took the time to explain how everything would work to her without making her feel bad about her situation. I never knew there were lifts toward the rear of the Magical Express buses allowing guests who cannot navigate the stairs access to the bus with no trouble. They also stow a wheelchair in the baggage compartment to use to get folks off the bus once they reach their resort. I was sure to give our driver a nice tip for being so sweet and helpful to our family. Things didn’t go as seemlessly on their return trip, but it worked out in the end. I went to the front desk at the Polynesian to double check the procedure when a wheelchair was required for the return trip. The cast member I spoke to didn’t know the answer so she called the company who runs the buses for Magical Express. There was quite a bit of confusion between her and whoever she spoke to on the phone and no real resolution to my questions. It took a hotel manager calling back again to ensure that my mom would be accommodated on the ride back to the airport. It took a while, but we figured it all about, and the cast members at the Polynesian really went above and beyond to help me. Speaking of buses, all of the Disney World transportation is wheelchair and ECV accessible and cast members operating the buses, boats, and monorails are all happy to help whenever they are needed. I found all those who helped my mom to be patient and sweet. Since she was a novice with her scooter, she often needed instruction as to how to properly get herself onto a bus or monorail. After a few tries she became more comfortable, but her first few attempts were pretty comical. If you are waiting for a bus, please be patient with the folks loading their wheelchairs or ECVs. They would much rather be able to stand in line and board with the rest of the crowd rather than having to hold up the works getting onto the bus. We have all been guilty of being in a rush to get to the parks or to our dinner reservation, but it will be fine if you arrive a few minutes later than you anticipated. Once at the parks I have a few more tips for you. Not all accessible bathrooms are created equal. 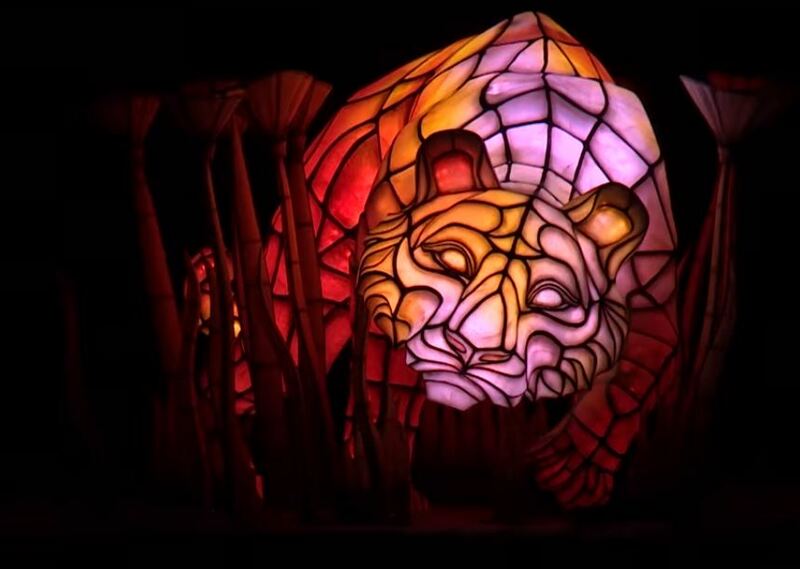 We found that the best and most spacious were at Disney’s Animal Kingdom. The rest rooms here are the newest in the parks so it is most likely that issues like accessibility were more thought when they were built. In several of the bathrooms here the accessible stalls are huge and easy to navigate. However, that is not always the case. In the bathroom in Africa there is an accessible toilet right by the front door. It is a separate room rather than a stall and it isn’t easy to make the sharp turn into it from the main door. Not only is it difficult to get in and out of, but in order to hold the door open for my mom I wound up wedged in the corner of the room behind the ECV! I had to wait for her to get up and then climb over it to get out. It was quite the scene. Also in the parks each attraction will have accommodations for guests needing assistance. At many of the newer attractions, all guests will wait in the regular queue, but may be pulled out to get to a more accessible loading area at any point. Some other attractions have queue specifically for folks who are using wheelchairs and ECVS. At the entrance to each attraction the cast member working as a greeter will be happy to instruct you as to what to do for that particular ride. Again, I found all of these cast members to be kind and thoughtful when talking to my mom about her scooter and her needs. I’ve always known Disney bent over backwards to help make everyone’s vacation magical and accessible to guests of all abilities. It was really nice to get to see this service for myself on my family vacation. I was delighted to see how my mother was treated with respect, dignity, and kindness especially since she was insecure about her first time using an ECV. If you are unsure of using an ECV or wheelchair in in the park, it can be challenging, but Disney does their best to make it as easy as possible. I may have missed some great ideas since I have only experienced traveling with an ECV once. If you have some tips for me and our readers please feel free to share them in the comments! I just recently had a trip where I was touring 2 friends that required ECVs. They are in their 70s and just don’t get around as well as they used to. The one tip I have is get to the Magic Kingdom very early on busy days as they have a tendency to run out of ECVs. We had no problems at the other parks. Unfortunately we were staying off site and our car would not fit rentals. The WDW ECVs are quite a bit more expensive then rentals from outside the park as well. Another tip I was given a little late. A couple parks have Handicapped maps specifically for people in wheelchairs and ECVs. You can procure them at the ECV rental desk. I didn’t know this till the last day of our trip and they didn’t have them at HS. People that gripe about ECVs and wheelchairs can assume that the people in them don’t need them. While this may be true at times I would bet the majority of them do need them. Cut people some slack because you never know if at some point in the future you might be someone that needs them. Thanks for the tips, Leslie! I’m sure many of our readers will find them helpful. On our trip in November of 2011 I was brought down by sciatica and had to rent an ECV due to numbness in my legs. I was one of those that got the “look” because I could walk onto and stand in line for most rides, and park outside and walk into restrooms, etc., but constant walking for hours was painful. Don’t ever assume that someone is “perfectly able to walk” just by their appearance – trust me, it is no picnic to try to move through the crowd on an ECV all the while getting the “look.” Be kind to one another. Those are my sentiments exactly! I think half my mom’s worry about using an ECV was that people would look at her or judge her. You are definitely right that it’s a pain to navigate ECVs through the crowd and obviously people who are able to walk would rather do so. Thanks for the comment! I actually rented an ECV the day after my half marathon in January. I had sprained my knee at mile 5 and kept going through the end. Despite icing and lots of other care, I could barely walk on it the next day. So, I toured EPCOT with my marathon medal and shirt on, in an ECV rented from Disney. I, too, was impressed with WDW and the CMs. It was a remarkably easy process, and the CMs seemed really well trained on how to manage loading or help you navigate. Oh no! I hope you made a speedy recovery from your injury. Aren’t the cast members great? Thanks for the comment! Thank you for all the input. My husband had a very successful kidney transplant (I was the donor!) a couple of years ago, but not before severe damage was done to the nerves in his hands and feet. We are planning our first trip to Disney World in October – two weeks at Camp Wilderness. That will give us the opportunity to just be at any one park for the few hours a day he can manage out and about but still be there long enough to experience a lot. He will be using a motorized scooter for the first time and is apprehensive about the process of navigating the transportion systems, attractions, etc. As outlined though, I suppose after a few days, we will become experts. I have also read that sometimes it is better to just drive to the park you are visiting instead of navigating through the buses and ferries? Regardless, we are looking forward to the trip! Thanks for the info! I hope you and your husband have a great time on your upcoming trip! Tell him he will be just fine getting around in his scooter. If my mom can do it anyone can! I can’t comment on driving to the parks with an ECV because we just took the bus. It really wasn’t any trouble doing so though, if that is any help. Thanks for the comment! In the book (which I found reading the touringplans blogs) The dark side of disney, the handicapped queuing situation is laid out very well for a lot of the specific rides. The intention of the author was to explain a cheating scenario whereby one steals a wheelchair from utilidoors and then cuts in line where people in wheelchairs wait for much less time. But it would be a good guide on which rides are an advantage for handicapped and which rides are neutral and which rides disadvantage the handicapped. Also, when it comes to the ECV loading on a bus… it is a pain. If you have a van and handicapped placard, it’s much easier just to drive and park. But most people are renting an ECV, don’t have a good way to put it in their car or van if they even have their own car. But you can ride the bus around everywhere. Thanks… We do have the handicapped placard and I think we will take that suggestion and drive and park. Thanks for letting us know about the ease of driving your own car with the ECV. That should be helpful to several people! kiyono – hi jonas, it’s me, surya’s mom. thank you for saving the magic and buatey of the day. your work brings it all back. the photo of suri waiting for nick to see her for the first time captures her from birth to that moment breath held, hopes and dreams realized. and somehow your presence was also a part of it all. you weren’t just the photographer you were a participant in the celebration. they loved you from the moment they found you. yup, meant to be. I am in a wheelchair all the while, we live in the UK, but we always holiday in WDW as Disney always make our vacation magical as much as they possibly can, we stay on site as we are DVC members. My only downside to this is the increasing number of people who hire the ecv’s etc as they think it can help them cut lines etc when there is nothing wrong with them, I have seen & even heard this being said on the numerous trips & over the years. This is not fair to those that need these aids to get around Disney, I have seen people dump wheelchairs and run for buses it’s appalling. I take my own power hair with me & have been asked if I really need it in the past, if only I didn’t. The Disney ships are also very accessible as well, Disney do try there best to help people we always go to guest services to get our guest assistance pass even though rarely use as I don’t do many rides these days. The rides do state which are suitable to ride in the disabled handbooks you get from guest services. I completely agree with you, and that is why Guest Relations and our Rental locations have been a bit more strict when it comes to lending out ECV’s and wheelchairs to Guests so that we can avoid situations like that. People abusing a system is unfortunately unavoidable, although I agree with you that it is terrible. Those people are also who make people who legitimately need a wheelchair or ECV look lazy. I’m glad you and your family have found WDW to have great access for you and your power chair! It is so sad that people have to worry about being judged for using a wheel chair or ECV. Try not to worry about the ignorance of people passing judgement. Just imagine how miserable they have to be to judge and complain about other people just because they are riding on wheels. The people who are really enjoying the parks would not even think twice about those in an ECV. Isn’t it sad? I’m glad my mom had a positive experience and I hope the majority of folks who need to use a wheelchair ECV have the same despite some people’s need to judge. Thanks for the comment! Any suggestions for dealing with handicapped passes for kids? I have a son(14) had a liver transplant. He has many issues still and a daughter who is hearing impaired. Will the touring plans work for us? Go to Guest Relations at each theme park with a doctor’s note or some kind of evidence of what your child requires during your magical vacation. Usually, they don’t need it, but again with new ADA laws, Guest Relations has had to amp up what is considered for a Guest Assistance Card. As Kayla said you can go to Guest Relations and get a Guest Assistance card. You should not have any trouble getting one after explaining your children’s medical needs, but it is never a bad idea to have a doctor’s note to back you up. I have only needed on once after I injured the tendons in my foot and they didn’t ask any questions at all. Touring plans will certainly work for you. You can always skip an attraction on the list if you don’t think it is suitable for your family and keep moving on to the next one. I hope that helped! Coming from a resort Cast Member, when it comes to room reservations and once you arrive at your Disney resort, requesting an Accessible room as soon as possible is the best way to go. With new ADA laws, there is no longer a “Special Needs” line for Guests to call in order to be guarenteed a room, but we most definitely keep aside those Accessible rooms for our Guests who request and require the accommodations. Thanks for the tip, Kayla! I made sure to make the request when we made our reservation and then asked again when checking in. It worked out very well for us. The downside of folks abusing the system is that unfortunately some castmembers, if you are on the younger side, have begun to automatically assume you dont need your wheelchair. My girlfriend and I (I am 26, she is 24) had planned our trip to Disney last December not realizing she would need a wheelchair. After an unexpected surgery on both her feet, she had to be in a wheelchair for all of our trip. Numerous times while using the bus system, we were either left on the bus because the driver forgot we were there (twice)or treated incredibly rudely by the driver (visible eye rolling when he got out and had to help us aboard). Twice we were informed by cast members that we couldnt sit in handicapped areas because they were for people who were “really handicapped” and since it “looked like she could walk” that we needed to move. ARE YOU KIDDING ME? I dont want to make it seem like all castmembers are like that because the majority were extremely helpful, there are just a few here and there that could really ruin your day if you come across the wrong one. also, a tip, you may want to visit guest relations at the entrance to each park. while there you can get a card that allows you to move to the front of the line (or close to it) if you are with someone that cannot wait for a long time (lauren couldnt stand for a long time so we got one of these cards, you show it at the beginning of the line and they direct you sometimes a different way than even the handicapped access line to board the ride). I’m one of those people who just can’t walk the miles at the parks anymore, but I’m perfectly capable of being able to stand in line and walk normal. I only need an ECV to get from point to point over long distances throughout the parks. One of my biggest concerns is being able to find a place to park the ECV and use the regular lines. I don’t want to tie up the special lines and areas for those who need them. Does anyone know if there are places to park the ECVs outside rides, attractions, stores and restaurants? 1) Will the battery life of the ECV last all day? I’m talking 9am to 10pm, but with several times throughout the day with ignition off. 2)Are the batteries portable/light enough to carry a spare (in the basket, perhaps)? Are the batteries easy to change out? Do ECV rental companies (not within WDW) provide spare batteries? 2) Are there places to park ECV’s when we want to go into a shop, queue up for a line, sit down and eat? We will be taking a stroller as well for our daughter so we’ll need to park them both. 3) I assume these ECVs come with a key. Once the key is out of the ignition can I assume that theft/movement of the ECV is not possible? 4) I am planning to rent the ECV offsite. Will I be required to show proof of my temporary disability to enter the park (MK) with the ECV? Thanks in advance for your replies, folks. This is new for me and I am unsure of what to expect. Hi Sharon! I too have some of the same questions as you (see post above yours), but can answer a few of your questions from my investigations. 1) Most ECVs can go about 25 miles. 8-12 miles is the average for the parks, so a backup battery shouldn’t be needed. Recommendations are to use the ECV at medium speed and avoid using the headlight to conserve battery power. And be sure to charge it up each night. 2) The batteries are like a car battery and larger ECVs use two. Due to the weight, spares aren’t practical to carry around. If the battery does die, you should be able to call the vendor. Some people carry the charger with them and use it when they go to dine. Some models do not require an external charger and can be plugged in directly. Some restaurants need you to park the ECV, usually in the lobby. I don’t know about going into shops. 3) The ECV comes with a key, but there is also a freewheel lever to disconnect the motor and brake for easy pushing to another location. I don’t know about ECVs, but strollers are frequently moved by cast members to make room for new guests. 4) Anyone can rent an ECV and use it in the parks. No proof of a disability is required. Have a wonderful time at the house of the mouse. I know you will enjoy Christmastime there – it’s beautiful! Please let me know how you came out with going in the stores and on rides and what you did with your ECV at those times. Thanks! A quick follow up post-trip. I rented from Scooterbug, and got their foldable, smallest model. Battery power was great, lasted all day and then some. I typically parked the ECV at each attraction. Some locations had specified ECV parking areas, while at others I just parked it along with the strollers. I never had an issue with finding a safe place to park. I some stores I even rode it into the store and parked it in a corner. Same thing with restaurants. Overall a wonderful experience. Thankfully my foot is fully healed now but the ECV definitely made the trip a success. Thanks to all for your comments, it helped that I knew what to expect. Thank you for the great update, Sharon. Great to know there are places to park to get on attractions and visit stores. Very cool! Thanks for your comments. I had foot surgery so I know I will not be able to last all day at the park so I rented an EVC to be ready when I get to disney. I am parking the thing and standing in lines , my foot just wont last all the walking. Hopefully no one will judge me.